Though the Grammys are still a month away, the Jonas Brothers – who are up for best new artist – have the jitters. 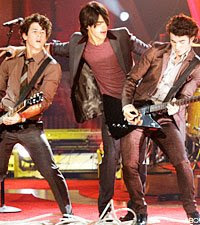 After a full day of filming their new Disney Channel show J.O.N.A.S., the pop-rock trio – which also includes Joe, 19, and Nick, 16 – had to hightail it to L.A.’s Nokia Theatre for the special primetime Grammy nomination concert on Dec. 3. Win or lose, one thing’s certain: “We will be on time for the Grammys!” says Joe. CBS will broadcast the 51st Grammy Awards live from the Staples Center in Los Angeles on Feb. 8.